Don't get caught off-guard. Read the FAQs below to know what you need to do to prepare for your trip. Where do I meet the shuttle? The shuttle pick up is at the Black Sands Beach trailhead (Google Maps) in Shelter Cove. PLEASE ARRIVE AT LEAST 15 MINUTES BEFORE YOUR SCHEDULED DEPARTURE TIME. If you're driving to the meeting place same day, be sure to account for possible traffic (especially from the Bay Area) and allow plenty of travel time. What is a bear canister? It helps keep bears away. Bear canisters are containers for your food, scented items like toiletries, and scented garbage. They’re sturdy enough to prevent bears from smelling or stealing your stuff (usually). They are required for all trail hikers. How many bear canisters do I need? Each hiker needs 1 bear can, which generally stores 3 days’ worth of food, toiletries, and garbage per hiker. If you’re experienced in traveling light and think you can stash 2 hikers’ worth of scented items in 1 bear canister, feel free to pair up. Where can I get bear canisters? See the approved models and links to buy here. You can also rent bear canisters from us for $20/can for up to 4 days. Please let us know at the time of booking how many you will need. Note: If you fail to return your canister(s), we will charge $60/each to your credit card on file for replacements. Which bear canister(s) do you recommend? What model of bear canister do you rent? Where do I return my rental bear canister? 210 Wave Drive, Whitethorn, CA 95589. Your driver will go over the drop off procedure when you meet your shuttle. 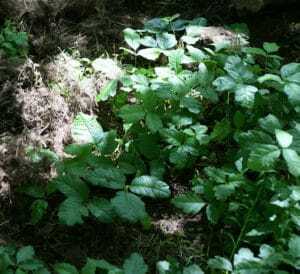 What kinds of bears are found near the Lost Coast Trail? Check out this helpful article on California black bears. It notes that you’re statistically more likely to be struck by lightning or eaten by a shark than attacked by a black bear. But don’t tempt them! Get your bear canisters! Can I bring my dog on the Lost Coast Trail? Yes, but it’s not much fun for them, and unless your furbaby is a seasoned hiker, it’s not recommended. The sand and rocks can rub their paws pads raw, and jumping between boulders can make their nails bleed. If I do bring my dog, do I need any special gear for them? Yes, please bring dog boots for them to wear throughout the trip. Consider bringing a leash in case your pal is especially frisky early in the day—you don’t want them to wear themselves out. Is there an extra charge for bringing my dog? If you book a shuttle ride with your pup we charge a minimum cleaning fee of $30. We love dogs, but we have to clean very carefully afterwards to accommodate passengers who are allergic to our four-legged friends. 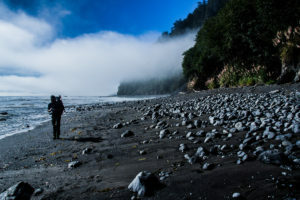 How much is a permit for the Lost Coast trail? When and where should I get my permit? Please book your permit before you book your trip dates. Book your permit here. Where can I stay overnight near Shelter Cove? The Inn of the Lost Coast and The Tides Inn are both located in Shelter Cove and very accessible. You can also camp at Wailaki campground about 15 minutes before you reach Shelter Cove. This camp ground has no showers. Can I call or text on the trail? Nope. Don’t count on using your phone on the trail or on the way there (except for taking pictures). We’ve heard rumors of Verizon customers getting a bit of reception now and then, but seriously—don’t rely on it. Can I use a satellite phone? Yes. You may also bring a Spot or similar GPS-based tracking and communication device. NOTE: If you are hiking the trail during the high season (May–Sept.) you will generally come across other hikers who may be able to assist you if needed. Once you leave Shelter Cove there are no ATMs or other places to get cash. It's a good idea to bring enough for possible emergencies. Look out for Northern Pacific rattlesnakes especially when hiking near driftwood, high grass, or brush—you don’t want to surprise one, as they tend to strike when they feel threatened (but will hang back if given space). What do I do if I'm bitten by a snake? Check out this Wild Backpacker article on treating snake bites. Make this your mantra throughout your journey. Ocean conditions can change rapidly, and large “sneaker waves” sometimes spring out of a calm sea. Are sneaker waves all that dangerous? YES. The steep beaches create a powerful undertow, and rip currents are common. Your odds of survival in the cold water decrease rapidly after 20 minutes. Ticks flourish along the trail, and many of them carry and transmit Borrelia burgdorferi, the bacterium responsible for Lyme disease. Lyme disease is a potentially serious illness transmitted by a tick bite. If caught early, it can be successfully treated with antibiotics, but left untreated, the infection can spread to joints, the heart, and the nervous system. How can I tell if I’ve been infected? Early symptoms feel like the flu, and most people will see a bulls-eye rash at the site of the infected bite within 3-30 days (7 days on average). See more about signs and symptoms here. What should I wear to help avoid tick bites? Wear light-colored clothing—it’s easier to spot ticks that way. Tuck your shirt into your pants, and tuck your pants into your socks. Wear a hat, too. Should I use tick repellent? Which one? It’s a good idea to spray your shoes, socks, belt-line, collar, and hat with tick repellent. Read the Center for Disease Control’s (CDC’s) info on natural tick repellents and pesticides here. Where and when should I do a tick check? Check for ticks often: Take a good look at any exposed skin and your clothing, and don’t forget your scalp and behind your ears. Also, when you wake up, check your sleeping bag for ticks that may have bitten and detached from you. What if I’m bitten by a tick? Don’t panic! Antibiotics can often cure Lyme disease if administered within the first few weeks of an infection. Use tweezers to grasp the tick as close to the skin as possible, or use your fingers protected with tissue paper. Pull the tick straight out, being very careful not to squeeze or crush it. Remove any tick mouth parts that break off in the wound. Wash the wound with generous amounts of soap and water, and apply a mild antiseptic if available. Stick the tick on tape and bring it to your doctor or local clinic as soon as possible to have it tested. Why do I need to (yes, need to) check a tide predictions chart? Red alert: Hiking during high tides can be fatal, even for very experienced hikers. About 9.5 miles of the trail between Shelter Cove and Mattole Beach is impassable at high tide. High tides occur twice in each 24-hr. period, but they occur at different times every day. Since there’s no phone reception on the trail, you must check the National Oceanic and Atmospheric Administration (NOAA) tide prediction chart for each day of your trip before you go. Where do I check the tide predictions chart? Get the tide prediction chart from the National Oceanic and Atmospheric Administration here. The NOAA chart shows tide information in feet on the left and time on the bottom. You can see how high the tides will be at any given time where the lines intersect. Is there fresh water along the trail? Yes, and most of the freshwater streams are just a few miles apart from each other. Can I drink water straight from the stream? NO! Do NOT drink untreated water—it contains pathogens and contaminants you can’t see. Top tip: Filter extra water at the smaller streams. In the summer, water from smaller streams tastes a lot better than water from the larger streams (like Flat Creek and Cooskie Creek). Most rainfall occurs between October and May. June–September is usually dry and mild, with the occasional storm. Check the 10-day forecast through the NOAA website. Be sure to secure your tents firmly when camping; sometimes down-canyon winds up to 60 mph can arise. It’s a good idea to bring sand stakes or otherwise be prepared to weigh down your tent. The Lost Coast has one of the only primordial ecosystems left on the California Coast. Please clean your boots and gear before hiking here. 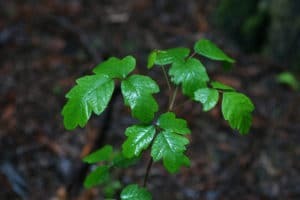 Otherwise you could be spreading plant species from your last backpacking trip. Please bury poop 6-8 inches in the wet sand, below the high tide line. On inland trails, you must bury your waste at least 200 feet from streams, camps, and trails. Learn more about the Leave No Trace 7 Principles here. Wash dishes in the intertidal zone. Please only wash dishes and use dish soap 200 feet or more away from streams. You can also do this in the intertidal zone (the area that is above water at low tide and under water at high tide—between tide marks). It’s not for the novice hiker. There are lots of boulders and cobbles to climb over. Very few stretches of packed sand. Is there a bus or other public transit? Nope—no public transportation to/from the trail. Can I drive to the trail? Strictly speaking, yes, you can drive two cars and leave one at the trail’s end before you drive to your starting point. BUT: It’s 2 hours of bumpy, windy, unfamiliar roads—not recommended. Meet your shuttle at the Black Sands Beach Trailhead in Shelter Cove (Map). PLEASE ARRIVE AT LEAST 15 MINUTES BEFORE YOUR SCHEDULED DEPARTURE TIME.